The International Position on Tibet. Government of the Dalai Lama, 1959. First edition of this important document, which details the historical relationship between Tibet and China from the 7th century to the 1950s and presents arguments supporting Tibet’s claim for sovereignty. Octavo, original printed flexible board wrappers, with the title and date printed in red letters. Boldly signed by His Holiness the Dalai Lama on the front panel. Table of contents and 63 pages of text. In 1959 the Dalai Lama sought support from the U.S. and other nations to recognize their government in exile and to bring their case for Tibetan sovereignty and against Chinese aggression before the United Nations. It is necessary to distinguish between two 1959 publications under the same title. The more common (today) appears to be an octavo volume of 49 pages, which several sources attribute to the Central Electric Press in Delhi, India. [The British Library and Harvard University each has a copy in that smaller format; WorldCat details 10 locations of the 49 p. 8vo edition, under two OCLC numbers]. Our publication, a mimeographic duplication from a document produced on a typewriter, printed on rectos only of quarto sized sheets, has 63 leaves and an un-numbered first leaf [“Table of Contents”]. Technical limitations mean that our publication in quarto mimeographed format, is both more fragile by nature and less likely to have been issued in a large number of copies. Considering that the 14th Dalai Lama spent all but the first 90 days of 1959 residing in exile in Dharamshala, in the state of Himachal Pradesh in northern India, it is likely that our publication was produced there. Historical Context: In 1959, within days of the rapidly devolving March uprising in Lhasa, the Dalai Lama and his retinue fled Tibet with the help of the CIA’s Special Activities Division. They crossed the border into India on 30 March 1959, and soon afterward, the Dalai Lama set up the Government of Tibet in Exile in Dharamshala, receiving support from the CIA including a personal annual stipend of $180,000 and other material support from at least 1959 until about 1974. (CIA support for the Government of the Dalai Lama in Exile and other potential Tibetan assets reportedly totalled about $1.7 million per annum). In April 1959 the Dalai Lama sent a message to the U.S. Government requesting that the U.S. formally recognize the Free Tibetan Government and that he encourage other nations to do so. Under Secretary of State C. Douglas Dillon advised President Eisenhower that the U.S. should “avoid taking any position which might encourage the Dalai Lama to seek international recognition.” Despite considerable U.S. covert support of the Tibetans’ efforts to oust the Chinese, the official U.S. position held that Tibet was an autonomous country under Chinese suzerainty. The State Department believed this position better served America’s broader foreign policy interest viz. China and India. In fact, the Eisenhower administration (both the State Department and the CIA) restrained the Tibetans from presenting their case against Chinese aggression, instead skirting the political issues and treading the softer line of human rights violations and cultural oppression. The Tibetans finally enlisted Ireland and Malaya to request “The Question of Tibet” to be added to the U.N. agenda for its 14th session. Consequently, the United Nations’ Resolution 1353 (XIV) on Tibet was passed in October 1959. 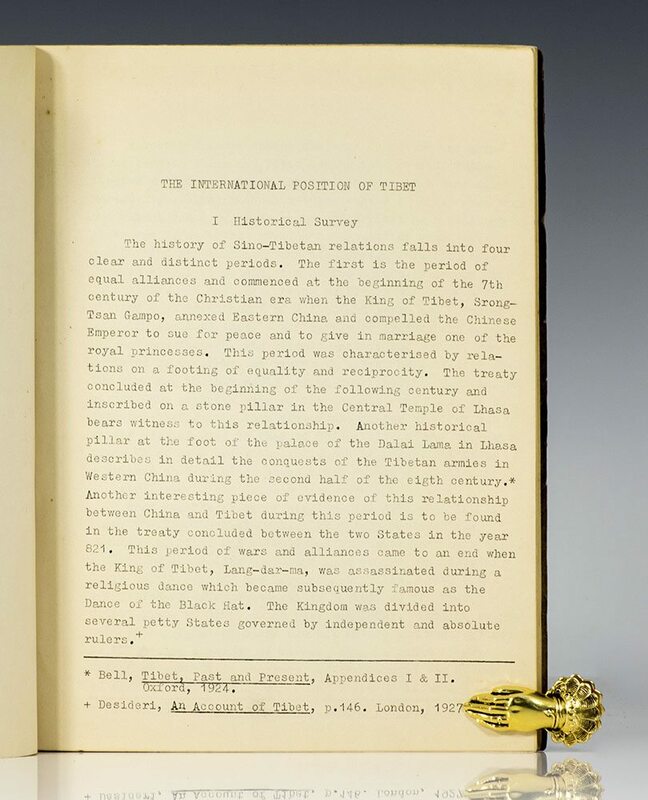 This first U.N. resolution on Tibet did not address the sovereignty issue, but voiced their “grave concern at the continued violation of the fundamental rights and freedoms of Tibetans” and calling for “respect of the fundamental human rights of the Tibetan people and for their distinctive cultural and religious life.” For an interesting exposition of this era of Tibetan diplomacy, see “Tibet Issue at the UN: a case study in informal diplomacy, (1950-65)” by Kalzang Diki Bhutia. Either directly or indirectly, this publication was made possible by support from the CIA; it is a fascination sidelight of history that the official US government position was not in alignment with this text, and also, that no copy of our rare publication seems to have survived in any institutional library in the United States. Housed in a custom half morocco clamshell box. 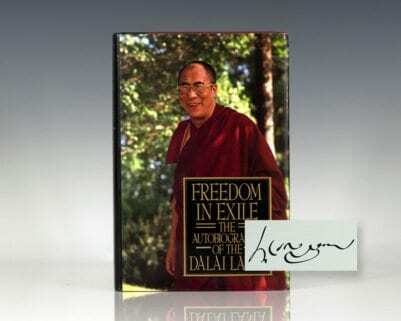 Freedom in Exile: The Autobiography of The Dalai Lama. New York : Harper Collins, 1990. 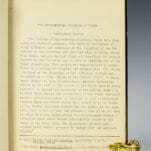 First edition of The Dalai Lama’s autobiography. Octavo, original half cloth, illustrated. 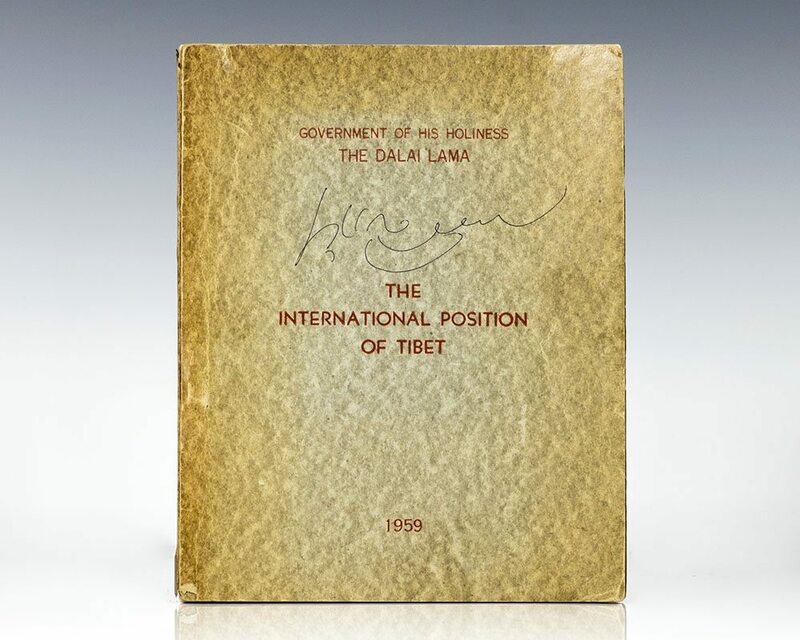 Boldly signed by His Holiness the Dalai Lama on the title page. Fine in a fine dust jacket. Jacket design by Neil Stuart. The Universe in a Single Atom: The Convergence of Science and Spirituality. New York: Morgan Books, 2006. First edition of this personal examination of The Dalai Lama’s teachers. Octavo, original half cloth. 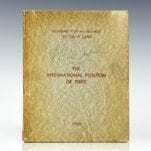 Signed by His Holiness The Dalai Lama on the title page. Fine in a fine dust jacket. Jacket design by Mark Melnick.